Strouse manufactures die cut tapes that are used to solive many adhesive application challenges. When most people think about adhesives they think of tape and labels. The materials provided by our suppliers are the most scientifically advanced adhesive materials in the world. They are meant to do much more than stick to a substrate; they serve functional needs to solve real-world adhesive applications. We solve a wide range of applications using adhesives from low-tack applications and simple perforations to multi-layered components and large die cuts, all precision cut to specification. That’s why we are More Than Tape. Don’t see one of your adhesive applications on this list? 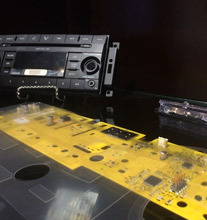 Contact our adhesive engineers and find out how we can help!